Cannot view pictures or comments on original post. Raised.bamboo cobalt and various blues on white porcelain. If you commented on first would you please do so again. Thanks. Thanks so much for your speedy response Peter. I think this is the only site I know of that had a server problem and answered a question in the same day. You are wonderful! 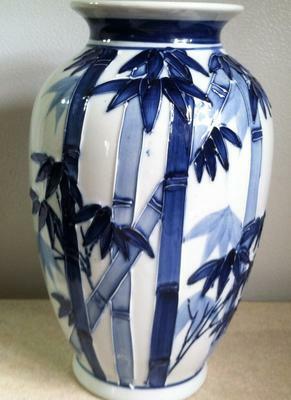 Vase depicts bamboo and bamboo shoots. Cannot tell you what the three dots are, but both the decoration and shape of the base look Japanese. Without bottom image it is difficult to tell whether this is older or contemporary. Please wait - there appears to be server problems. We have seen your images before saving the query but do not know why only the text appears. Support is trying to find the cause.